2) Make sure you are running Canon firmware 2.0.3. 2) Follow the on-screen instructions. Yesterday I tried to update the ML firmware decided to do everything with a "clean" card. Good news: Pelican's site is up and running and 7D has jumped the night train! Had a problem with AF (Phase AF not working at all) after copying the files to the card. Reset all cam settings, including custom functions and ML, too. Removed both batteries. Worked again. Bug: Phase AF not working properly with certain lenses after lens change. Reproducable. Used settings: All AF points are activated in One Shot mode. Step 1: Mount "older" lens (Canon EF 100/2.8 Macro USM, Canon EF-S 10-22, Sigma 18-125 OS): Phase detect AF is working as expected. Step 2: Mount "newer" lens (Canon EF 100/2.8 L, Canon EF-S 18-55 IS II, Canon EF-S 55-250 IS II): Phase detect AF is working as expected. Step 3: Mount "older" lens (Canon EF 100/2.8 Macro USM, Canon EF-S 10-22, Sigma 18-125 OS) again: Fokus hunt. Always missing to focus properly. Steps tried to make it work again. - Tried to turn cam off and on: Nope, error is still there. - Mounted other lens: Phase detect AF is working but only with "newer" lenses. "Old" lenses won't work with Phase AF. - Removed battery: "Old" lenses are working with Phase detect AF again. Error is reproducable in AI Servo when single AF point other than center is selected. Works with center AF point though. 10-22 (or any other ultra wide lens) is not recommended for doing this test because deep DOF may cause false focus confirmation. Okay, now start the camera by holding SET (so you load ML, but it should not be active). Is the bug still present? Pressed SET during startup, waited until menu arrived and tried: Bug is there. Started without card inserted: Bug missing. This sounds much like the EOS M bug, which I haven't been able to diagnose yet (see www.magiclantern.fm/forum/index.php?topic=8347 ). Note that you can't boot with a minimal binary on 7D because you need to poke both DIGICs (so don't try the autoexec from there; it will work on any other camera except 7D). Anything I can do assisting to solve the 7D riddle? Dumps, running diagnostics? 2) jumps to Canon startup address on the slave CPU (this is ML startup procedure without the patching part). If there's no focus bug with this autoexec, I know where to start digging. If it still has the bug... I'm lost. Start digging, the error is not there using this Autoexec.bin. Just removed battery, mounted 100/2.8 Macro, then 100/2.8 L, then 100/2.8. No focus hunt. This means it will be solved. hmmm... with this latest build (2013-12-20 14:35:15 +0100) I can not get continuous recording even on 1780x960... I was managing that with old builds..... Am I doing something wrong? As I and g3gg0 said it in your commit's comments the 7D platform was not outdated at all. I hope you now understand why I said it's outdated. Thanks for including the 7D back in official magic lantern nightly builds. For the purpose of informing those coming in recently to this thread is it possible to add in the logs or here in how this differs from the tragic lantern or other versions out there? What safety checks have been put in and what features were removed? At this point, it's simply the old 7D ML code, which - to me - still looks outdated, even if Pelican and g3gg0 have a different opinion. But I have high hopes that it will be brought back to speed. What safety checks have been put in? None. The correct question is what safety checks were removed in TL. This may help, but it's 3 months old, so you may need to review the code again. I doubt anything changed since then, but who knows. None. You should do a comparison (both by reviewing the code differences and by experimenting with both versions) to see what features were enabled in TL and not backported to the main repo. Wow. Lot of things happened here... Cool. The "official" nightly build contains the ML from the main repo. None of the changes of 1% merged back to here until now so don't start to complain about it. If you are using any TL build then keep using it. These nightly builds are for people who want to check the state of the main 7D ML. Backport TL changes to the main repo is a time consuming task but I prefer to keep 7D ML up to date. If you want a stable ML on your 7D you can help testing different functions and compare these functions in TL and ML. What the developers need mostly is feedback. So I've been following the forum since first 7D alpha 1 released. And then Raw video came out of nowhere for Mark II and of course like any other 7D owner started to dream for the day that it may be released for 7D. At first, most people kept saying "Raw video shooting will never be possible for 7D because the main processor of the 7D is unhackable" bla bla... And ofc Magic Lantern community proved those people wrong again. I've been paying close attention to this specific post for almost half a year now. Amazing improvements have happened since, major thanks to Pelican, %1, g33gl and everybody else helped out. At this point I can't wait any longer hoping that stable version for 7D raw video may be release any time soon. So I'll give it a try. I just downloaded the 2.0.3 nightly build 12/21/2013. I wanted to ask you guys where can I find the exact workflow to make it work in the camera and the workflow for post? That's the nightly build of MagicLantern. I think you'll find the raw recording performance (at least regarding the newer mlv_rec) with that version is not so polished as 1%'s TragicLantern (which doesn't have nightly builds at the moment, but has been the basis of the versions most recently discussed in this thread). Hopefully some of the performance-related changes in TL will be integrated back to the ML source in the near future so the ML 7D nightly builds are usable for RAW/MLV. Maybe you should still hold off a bit longer until that happens? Hi! 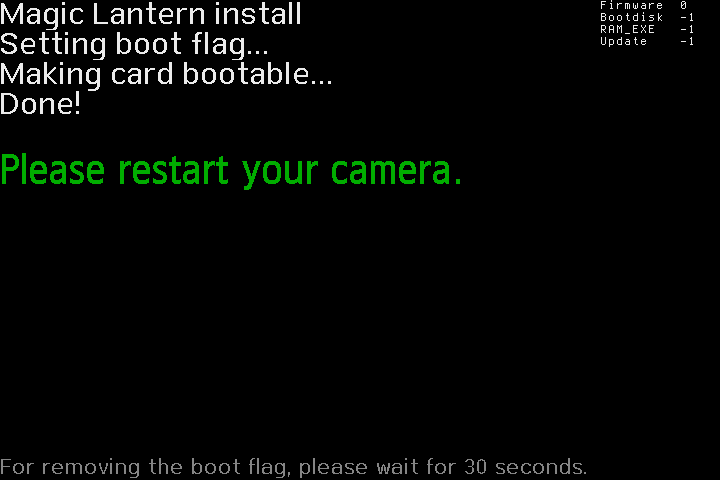 i put the new version of magic latern in my camera but i cant find fsp overwrite now?¿ where is it?? what is the new things of this version?? Thank you for the feedback. Can't I simply write the autoexec.bin file of TL to 2.0.3 nightly build to have the latest 7D raw shooting update? Please read http://www.magiclantern.fm/forum/index.php?topic=7503.msg92516#msg92516 and read it carefully. i cant find fsp overwrite now?¿ where is it?? You're using ML now. You may want to use Tragic Lantern as intended in the linked post. Can i help in some way to back porting TL to the main ML ?? and write down the differences between ML and TL, so developers should know exactly what to backport. Once there will be significant progress in backporting these things, I will enable the nightly builds again.